Hikone Castle, Shiga’s No. 1 cherry blossom spot. 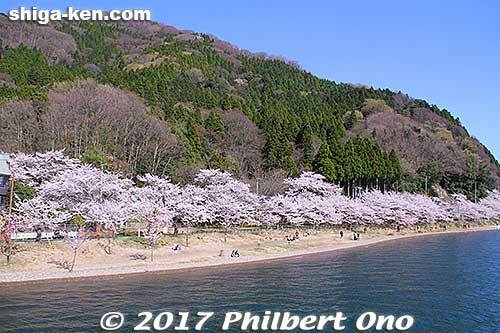 Here are my Top 5 favorite sakura spots in Shiga (click on the links or image to see more photos). Note that cherry blossoms bloom later in northern Shiga (Takashima and Nagahama) than in southern Shiga (Kusatsu, Otsu, etc.). *Tip: To see the current blooming condition, see the Weather News Sakura page for Shiga. Starting with brown that indicates buds, the markers show warmer colors until it becomes red (full bloom) indicating how far the flowers have bloomed. 1. Hikone Castle – Coming at No. 1 is Hikone Castle. Although Hikone Castle is not one of the 100 Famous Cherry Blossom Spots of Japan (according to the Japan Cherry Blossom Association), I think it’s Shiga’s prettiest and most photogenic. It has an awful lot of cherry blossom trees almost everywhere amid the dramatic backdrop of the castle, white walls, and moats. 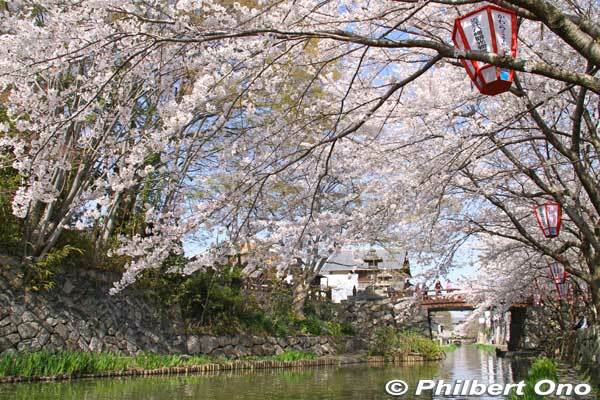 I found so many varied views and great camera angles for shooting cherry blossoms here. You can see cherries on the big stone walls, along the moats, and next to the main castle tower. Culturally and historically, cherry blossoms best match a castle (especially one that is a National Treasure, another reason why I rank it No. 1), a symbol of the samurai whose life was as fleeting as the sakura. 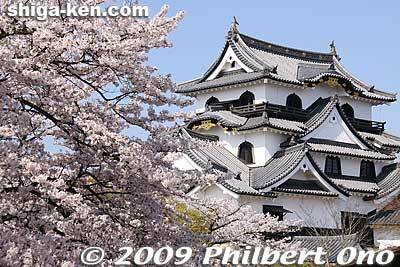 Hikone Castle is a short walk from Hikone Station. Google map. Kaizu-Osaki is nice but watch out for the cars. Kaizu-Osaki view from sakura cruise boat. 2. 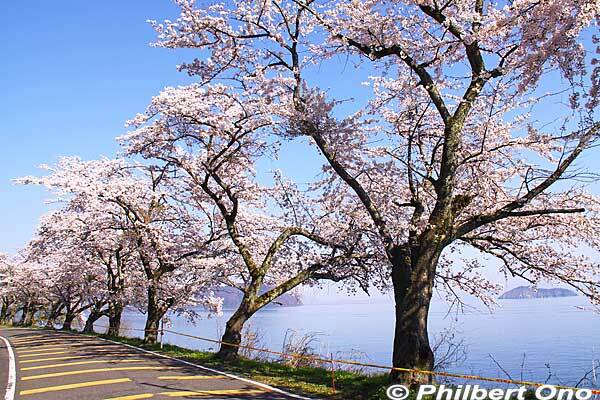 Kaizu-Osaki, Takashima – Kaizu-Osaki has cherry trees lining the northern shore of Lake Biwa for a few kilometers. The blue lake water and Chikubushima island provide a very Shiga-esque backdrop for the cherries. 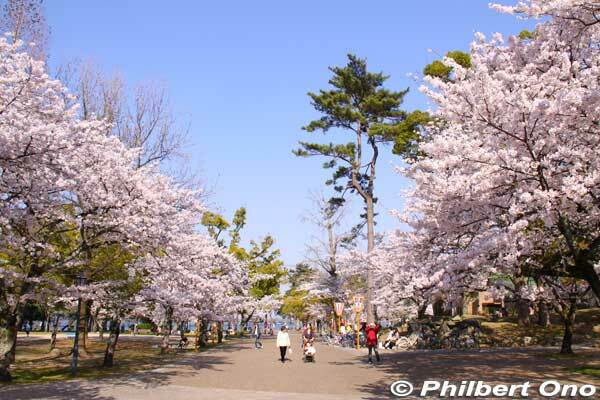 It’s one of Japan’s 100 Famous Cherry Blossom Spots, and I would rank it as Shiga’s No. 1 sakura spot if it weren’t for the hazardous viewing conditions. 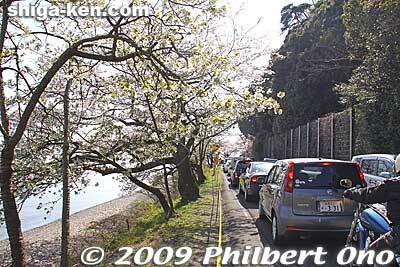 Kaizu-Osaki has a narrow and hazardous lakeshore road (with no sidewalk) right next to the shoreline trees. During the peak period, there are just too many cars passing by, squeezing out pedestrians and polluting the air. There is a short pedestrian path and small park at the beginning if you go from Makino Station, but it doesn’t go to the main part of the trees. Since there is no sidewalk on a large section of the lakeshore, you always have to be on guard for cars. Not recommended for families with young kids, especially on weekends. Also, the tunnels are dark and very narrow (no sidewalks). Bring a flashlight so the cars can see you walking or riding your bicycle inside the tunnel. So I recommend seeing Kaizu-Osaki by boat from Imazu Port, Nagahama Port, or Hikone Port. Boats leave quite frequently daily, and they may schedule extra boats on peak weekends. The fare is around ¥3,000 to ¥3,500. I highly recommend going on a cruise that also docks at Kaizu-Osaki Port where you can get off the boat and walk around Kaizu-Osaki for about 30 min. before returning to the boat. Otherwise, other boats just cruise along Kaizu-Osaki without docking. Note that if the water is rough on windy days, the boat might not be able to dock. More details here. Hokoen Park cherries and Lake Biwa from atop Nagahama Castle. Miidera’s Kondo main hall (National Treasure) and sakura. So, the places above are where I would show a first-time visitor wanting to see cherry blossoms in Shiga. 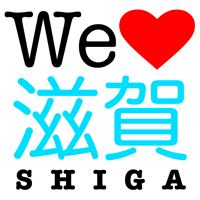 I selected them based on Shiga’s unique beauty or scenery, easy accessibility, and sightseeing value. 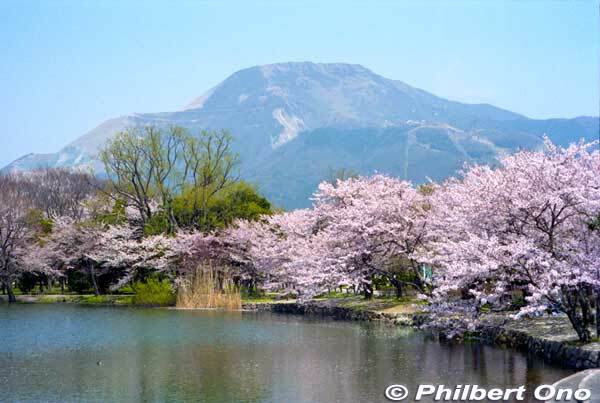 Mishima Pond and Mt. Ibuki in Maibara. Prime spot to photograph Shiga’s highest mountain and cherry blossoms. To see the current blooming condition, see the Weather News Sakura page for Shiga. Starting with brown that indicates buds, the markers show warmer colors until red (full bloom) indicating how far the flowers have bloomed right now. sakura さくら or 桜 – Cherry blossom and Japan’s national symbol and flower. By far, it is the most celebrated flower in Japan. tsubomi つぼみ – Flower buds. 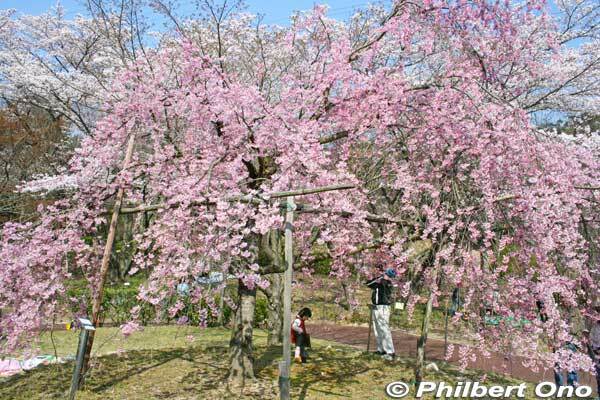 shichibu-zaki 七分咲き – Cherry blossoms in 70% bloom which is right before they reach full bloom. News reports consider 80% bloom to be full bloom (mankai). sakura zensen 桜前線 – Cherry blossom front as they bloom across Japan from Okinawa to Hokkaido. kaika 開花 – Flowers started blooming. This is about a week before the tree reaches full bloom. mankai 満開 – Full bloom. You will hear this on the news often. hayasaki 早咲き – Early-blooming flowers. A few varieties of cherry blossoms bloom earlier than usual. hanami or ohanami 花見 – Flower-viewing picnic (often with alcohol) under the cherry blossoms at a park. The most common way to celebrate spring under the flowers and commonly seen in the news. 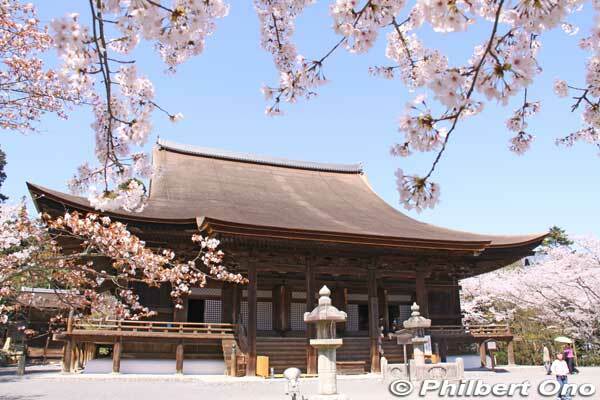 Hanami picnics are usually not allowed in shrines and temples. sakura matsuri さくらまつり or 桜祭り- Cherry blossom festival. Not a religious festival, but can take the form of various events and stage entertainment. Somei Yoshino 染井吉野 – The most common and coveted species of cherry blossoms whose light pink (almost white) flowers bloom in fluffy bunches on the tree. yo-zakura 夜桜 – Cherry blossoms lit up at night. Some temples and parks light up the flowers at night. 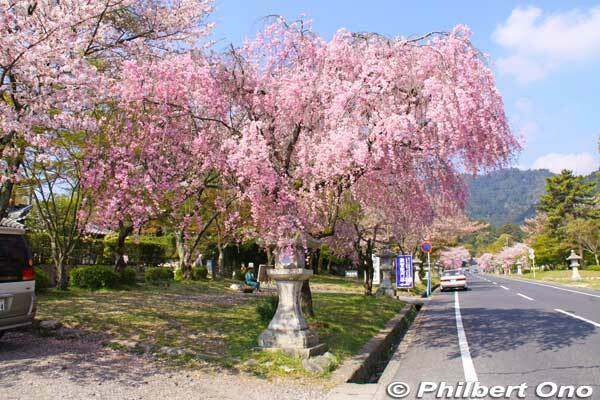 shidare-zakura しだれ桜 or 枝垂桜 – Weeping cherry blossoms with long, hanging branches of flowers. Sakura Meisho さくら名所 – Famous cherry blossom spot. It is most often a castle, public park, garden, shrine/temple, or riverside. Sakura, Sakura さくら さくら- Famous folk song about cherry blossoms. chiru, chitta 散る、散った – Flowers fell off the tree. Happens a few days after full bloom when the petals fall like pink snow. sakura fubuki さくら吹雪 – Swirling cherry blossom petals. Occurs when the wind blows off the flower petals, creating a pink snow.